How much will my legal services cost? We are pleased to provide our evolving guide to what you can expect to pay for certain routine legal tasks. Please see under the "Prices & compliance" tab at the top of our home page for details or click here. 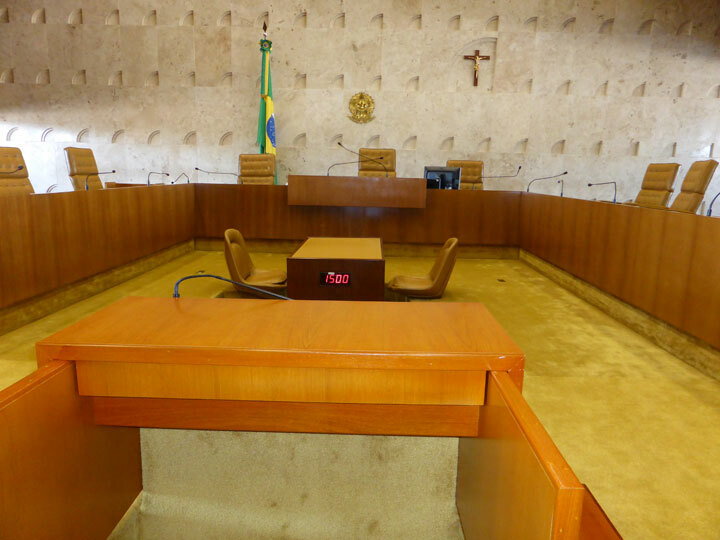 In Brazil the Supreme Court limits its lawyers to 15 minutes in which to address their issues and put their case - the countdown clock must be pretty intimidating if you have a lot of detail to get through! Why should you care about your "Deeds"? We store a lot of deeds for clients. Many of the packets of deeds we hold may now be largely irrelevant to the process of selling that property and indeed some of the properties for which we are holding the deeds may have been sold without ever needing to refer to anything in the bundle. How can this be? Well mostly because any transfer of ownership of a property now triggers the requirement to register the property at the Land Registry. Once registered the bulk of the information will be available to anyone who buys "office copy entries" (copies of the significant documents from the Registry) and those office copy entries may often provide all the information a buyer will need without reference to the old paper copy documents. Land Registry entries are not infallible and they often leave out things which can become very important, for example the planning permissions or building regulations approvals for the construction of the property will be in the original deeds but not in the Land Registry entries. The title plan will show the outline of the property - but may not show any boundary ownership markers which may have been in the original sales documents. There will certainly not be any Gas Safe certificates, electrical inspection reports or guarantees for windows, doors, boilers or conservatories held at the Registry - proving compliance with these matters, in the absence of the original deeds packet may cost quite a lot of money or lead to the bane of the conveyancers life - providing indemnity policies as a cheaper and more convenient option than actually being able to provide the real information. This is only going to get worse as the short cut solution of indemnity insurance policies has now become subject to European regulation in the form of the Insurance Distribution Directive which will make the provision of an indemnity policy much more difficult. If you are selling a property it is always worth finding your original deeds - and if you have sold a property without needing deeds but you know we may be holding a bundle for you then do please tell us - we have duties for safe-keeping and insurance of deeds and if you don't need us to store them we can put the saved money towards repairing our leaky roof!